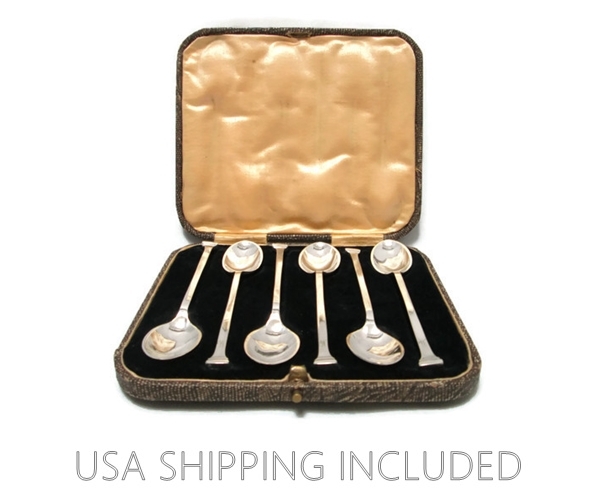 This set of six fine silver plated demitasse coffee spoons were made by Latham & Owen in Hallamshire in the city of Sheffield, England. Founded in 1921, the firm became quite well known for their fine tableware, as well as their cutlery. The set is boxed in its original genuine lizard skin case, lined with gold silk and black velvet. The marks on the back of the spoons consist of the following raised letters: L & O (Latham & Owen) S (for Sheffield) HALLAM PLATE (for Hallamshire) and A (for quality). The spoons, which are not quite 4 1/2 inches long, appear to be barely used, with faint, fine scratches only visible under magnification. The handles taper to a stepped Deco design, with the letter 'W' monogrammed at the base of each. The outside of the lizard case shows some rubbing in a few places and the brass catch mechanism no longer snaps open and closed; we've cleaned and polished it with specialty leather balm and it looks very handsome. The interior of the case is clean and in excellent condition. 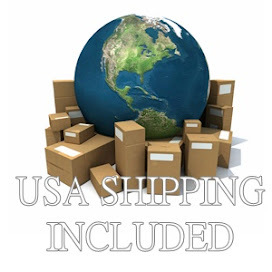 The case measures 5 3/4 inches wide, 5 inches top to bottom and about an inch high. This set is lovely for someone whose name matches the monogram letter; but monograms are evidence of a former, favored life and thus perfect for the lover of vintage items and, of course, of demitasse.